Brazilian cuisine seems to be a mystery to many Americans. What many people do not know is that Brazilians love fried, cheesy, sugary treats, and have perfected the art of making them. With the Olympics taking place in Rio this summer, it is time to integrate these four delicious examples of Brazilian snacks into American culture. 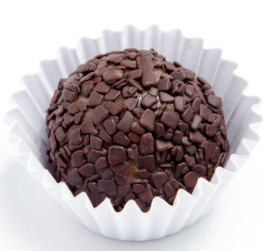 These gooey little balls of deliciousness are a huge part of everyday Brazilian life. Literally translated to “bread of cheese,” pão de queijo can be found in malls and at airports, as well as Brazilian ovens all over the country. Each Brazilian family has their own recipe for pão de queijo, and their favorite fillings for the snack. Such as honey, melted cheese or a mixture of mayo, mustard, ham, pickles and corn. Typically, a pão de queijo recipe includes parmesan cheese, eggs, oil, milk, and the most unique ingredient, sour cassava flour, which can be difficult to find outside of Brazil. After being baked, the mixture of cheese and the flour cause the squishy texture of the pão de queijo, which truly is the perfect “in-between” texture of bread and cheese. Brazilian grandmothers (or at least my Brazilian grandmothers) love to make fried snacks, like calça virada, on rainy days. 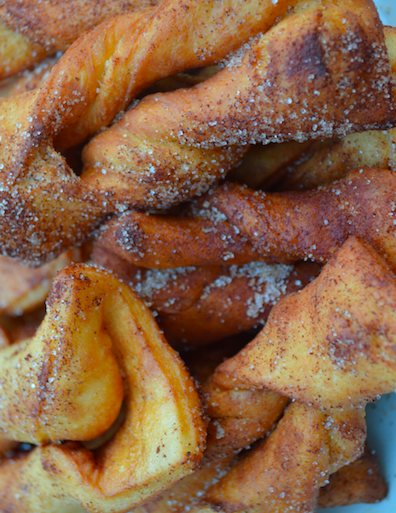 The simple yet delicious snack consists of fried dough, cinnamon and sugar. What more could you ask for? This snack might be named after what happens once you take a bite, calça virada literally translates to “flipped-over (or twisted) pants.” However, the name also likely comes from the shape of the fried dough, as it is cut in the middle to resemble pants, and then woven through, making them appear twisted. Some Brazilians like to use the alternative name “cueca virada,” which means “flipped-over underwear.” Deep fried like a doughnut and then generously coated in cinnamon and sugar, calça virada tastes French toast’s more robust cousin. Typically served at birthday parties and even weddings, this classic Brazilian treat is a great source of pride for the country. If you ever have the chance to pop one one them in your mouth you will understand why… It’s an ingenious recipe. All it takes to make these chocolaty, fudgy, little pieces of heaven is sweetened condensed milk, butter and cocoa powder. 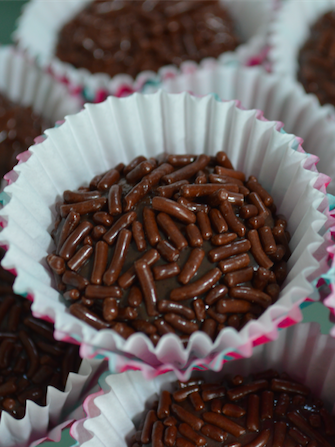 To make brigadeiro, mix all of these together in a sauce pan for around 10 minutes on low heat, continuously stir, allow the mixture to cool, then form into tiny chocolate spheres and toss in chocolate sprinkles. The taste is a perfect marriage of sweetness, creaminess and chocolaty-ness. The texture is somewhere between pudding and fudge. Once you have a first taste, you’ll be begging for more. 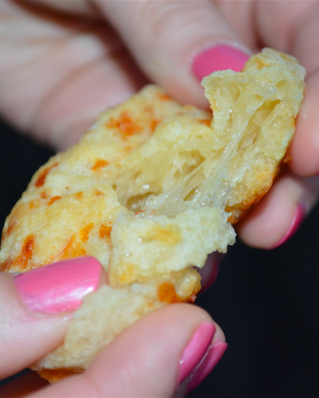 Coxinhas are the Brazilian version of a chicken dumpling. These doughy, savory snacks are also typically served at parties, and are quickly snatched up by hungry partygoers. 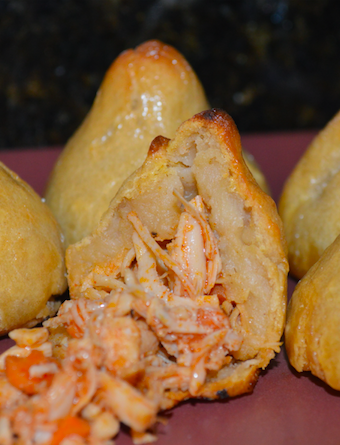 The thick dough surrounds shredded chicken and is typically deep fried, although many bake the coxinhas as a healthier option. The dough for the coxinhas can be made with flour, milk and water, no eggs. This allows the outside of the coxinha to become crispy and the inside to stay soft and squishy, without the fear of eating raw eggs. The juicy filling merges with this soft inside, making it a satisfying snack as you fuel up to dance all night as the Brazilians do.